Sun (left) and Kubota have gained friendship and understanding through LEP. Photo by Patrick Bradley. Zitian Sun awaited word of who his Japanese language partner would be. When the name Yuki finally arrived, he was surprised—he knew that name well. 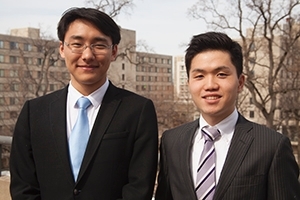 The two had been randomly matched through the university Language Exchange Program to practice their respective native tongues: Chinese Mandarin and Japanese. While already friends, the pair would soon find a stronger relationship ahead, due in large part to the program. Advisor for immigrant services and compliance Dong Jun Choi facilitates LEP through AU’s International Student & Scholar Services department. The program aims at increasing students’ foreign language abilities, while also giving them experience as teachers and providing cross-cultural exchange opportunities. When they first opened the brand new program to applicants in the fall, Choi and other ISSS staffers expected fewer than 100, perhaps 50, applications. “We realized a lot of students really want to know other cultures and practice other languages,” he said. The majority of the participants come from AU’s School of International Service, and for Choi, that’s no surprise. “With SIS students, if they want to communicate better with different cultures and countries, they need to know how to communicate effectively and efficiently,” he said. Though American, English-speaking students seeking foreign languages skills make up most of the participants, AU’s vibrant international student population from more than 140 countries also take part in the program to learn from one another. Still, AU’s international focus extends far beyond SIS and issues of international relations; participants also number largely from the College of Arts & Sciences and the Kogod School of Business. To Choi, the program’s linguistic benefits are obvious, bringing students a fuller understanding of their choice language—something that’s particularly useful if they plan on studying abroad. “We learn the formal way of speaking in the classroom, but this program allows students to learn the informal way outside of the classroom, like slang or cultural idioms and terms,” Choi said. More than that, Sun recognizes LEP as a tool for easing international students through the culture shock of arriving on campus. He should know—he was first a high school exchange student in Massachusetts, a far cry from his home in China. With all that in mind, Choi gives preference to visiting scholars, J-1 visa students—international students who will be at AU for a short period of time—and students who will be studying abroad. For those going abroad, the program not only works as language practice but also as a way to approach practical questions of traveling to the country of study. Their language partner can help them with questions such as how to secure a cellphone and what public transit is like. They can even provide advance introductions to friends back home to meet. Now, as Sun and Kubota’s friendship has become closer than ever, Kubota will soon return to his home university in Japan, but Sun won’t be far behind. He plans on spending a year at Waseda University with his good friend, furthering the connection that they can thank LEP for cementing.